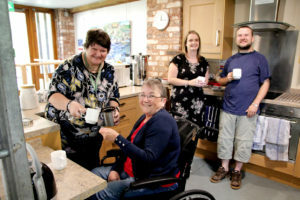 If you’re looking for a rewarding career that makes a real difference to the lives of local people, then a job with Headway Devon may be for you. For over seventeen years we have been providing a lifeline to people whose worlds have been turned upside down by brain injury. Our services support people across Devon and Torbay and reach over a hundred people each week. Headway Devon is an Investor in People, which means that we are committed to developing our staff team and ensuring that this is a positive and productive place to work. We offer a competitive salary and flexible working hours. An NVQ2 in care is desirable, but not essential as full training is provided. People from all backgrounds are welcomed. We are recruiting for Community Support Workers! Positions available in Exeter, Exmouth, Okehampton and Barnstaple.